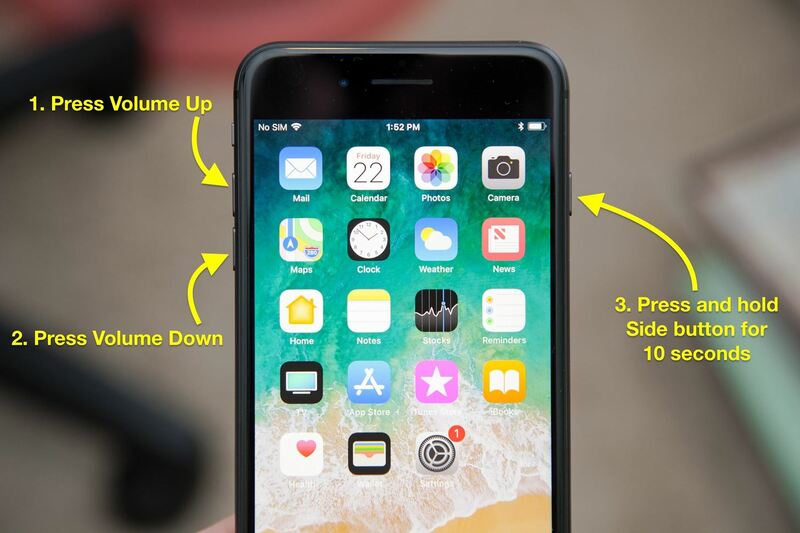 On the iPhone 7 and 7 Plus, you would just hold down the Side button with the Volume Down button for ten seconds until the Apple logo appeared. On earlier iPhone models, you would hold down the Home button and Side (or Top) button, aka the Sleep/Wake or Power button, simultaneously for ten seconds until the Apple logo showed up. So, you'd think that the process for the iPhone 8 and 8 Plus would be very similar to how those methods works, most likely the same as the iPhone 7 and 7 Plus models. But it's no longer about pressing two buttons together at the same time. Press and hold the Side button for ten seconds, until the Apple logo appears. Okay, maybe it's not so bad. After a few tries, you'll probably remember it, though you may get the Volume buttons order wrong on occasion. This is also the same process the new iPhone X will use to force-reboot.